NFL Survivor and Loser are getting new homes this season. 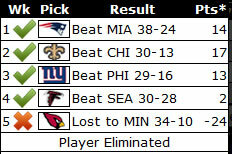 1 loss elimination, or multiple loss eliminations. 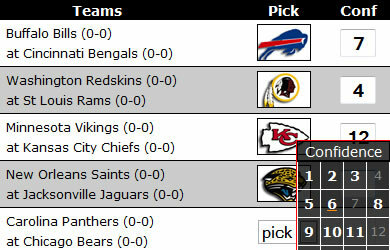 In previous seasons they have been tucked inside the main NFL pickem game. Now Survivor and Loser have become full scale contests where you can set all sorts of options. You can even run multiple survivor contests AT THE SAME TIME and have them start in different weeks, have different access codes, even different rules between one contest and the other. In cases where you force double picks, it makes players pick two picks that week in order to stay in the game. This can be used early in the season to make things interesting, or late in the season to really make things difficult on the finalists. You can choose which weeks will be used as double weeks and which would be single picks.